It perplexes me when the subject of cheese fondue comes up, and it’s often accompanied by a snide reference to the seventies. I find it sad that this quintessential alpine dish is relegated to a by-gone era evoking images of shag rugs, unfortunate hair and textured bell-bottoms. Certainly this was not intended when the rural inhabitants of Swiss and French mountainous villages devised a warming winter dish incorporating their local cheese and winter staples. I may be biased. I was never a fan of the seventies, even when I lived in them. Conversely, I am a huge fan of Switzerland. After all, I lived there for 10 years following my stint at cooking school in Paris. My husband and I were married in Switzerland, and our children were born there. As a result, Switzerland holds a special place in our hearts and will always be considered home to our family. The best way to a country’s soul is to experience its cuisine. As an expat in Geneva it was a delicious pleasure to embrace Swiss specialties, namely chocolate and cheese. We’ll leave the chocolate for another post. As for the cheese, we enjoyed it in all of its forms, and the Swiss tradition of melting it in deep pots with wine and spirits quickly became a favorite. When we eventually moved from Geneva to London, and then on to Copenhagen, I became more reliant on making my own version of fondue for wintry family dinners to satisfy our wistful cravings. This recipe has been tweaked and fine-tuned over the years, influenced by taste and available ingredients. In addition to serving it with the usual bread, I like to pass around bowls of parboiled baby potatoes, cauliflower and broccoli florets for dipping. Do not skimp on the cheese. 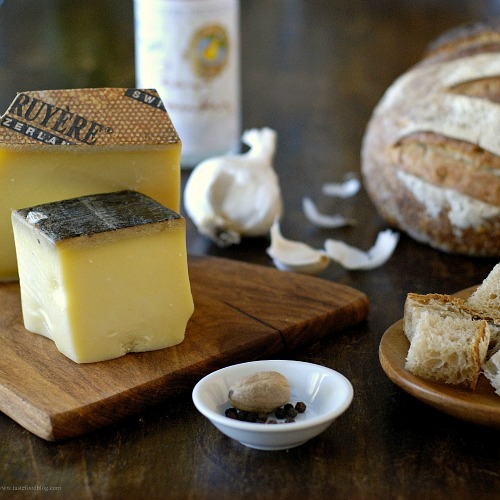 Purchase the best quality, cave-aged Swiss or French alpine cheese you can find such as Gruyère, Emmental, Comté, Beaufort. I like to use 2/3 Gruyere and 1/3 Emmental. Note: Have all of your ingredients ready before you begin. Once you start, the fondue will come together quickly, and during this time it must be constantly stirred. The fondue must not come to a boil during this time. Combine Calvados, cornstarch, salt, 1/2 teaspoon black pepper and nutmeg in a small bowl, stirring to dissolve the cornstarch. Set aside. Add wine and garlic to a large heavy saucepan or fondue pot. Heat over medium heat until tiny bubbles form, giving the wine a fizzy appearance without bringing to a boil. Add cheese one handful at a time, stirring constantly until each handful is melted before adding the next – do not let the fondue boil. Once cheese is added, continue stirring one minute – do not let the fondue boil. Stir in cornstarch. Continue stirring until mixture thickens to fondue consistency. (I find that some cornstarch brands thicken more easily than others. If your fondue remains thin, add 1 more tablespoon cornstarch diluted with 2 tablespoons white wine.) Remove from heat. Pour cheese into a warm fondue pot if necessary. Serve immediately. Serve with extra ground pepper, bread and parboiled vegetables such as small potatoes, cauliflower and broccoli florets. Great to see that you’ve used Swiss Gruyère. In Switzerland, we also add Vacherin Fribourgeois to the mix. Oh yes, I too am a child from the 70s [Eha, don’t fib: you were there before :)!]. Having fondue whilst in Europe [live Down Under!] and having it here for endless dinner parties surely was de rigeur 🙂 ! Fun 😀 ! When you were not doing the same cook-yourself savoury thing with Japanese meat/veg recipes! Really have to seek my old fondue pots etc from the back of the cupboards! Like your interpretation: don’t remember putting Calvados [which I love] nor ‘quite’ as much vino into the mix: hmmm – really have to go retro!! I have to laugh about fondue being out of “style”! Cupcakes and Bundt cakes once languished in that territory! I’m all for cooking and baking whatever suits our needs to nourish. And if we can have a bit of fun while we’re in the kitchen, all the better! And fondue meets both criteria! Need to turn my kids onto fondue, I haven’t had it in years. It’s heavenly good! Cheese on the pic looks so tasty!